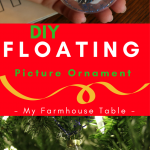 My mom started making these DIY Floating Picture Ornaments years ago. She has made so many we have one whole tree devoted to displaying these ornaments at Christmas time. And if you have someone on your Christmas gift list, who is notoriously difficult to buy for, these are your DIY answer! 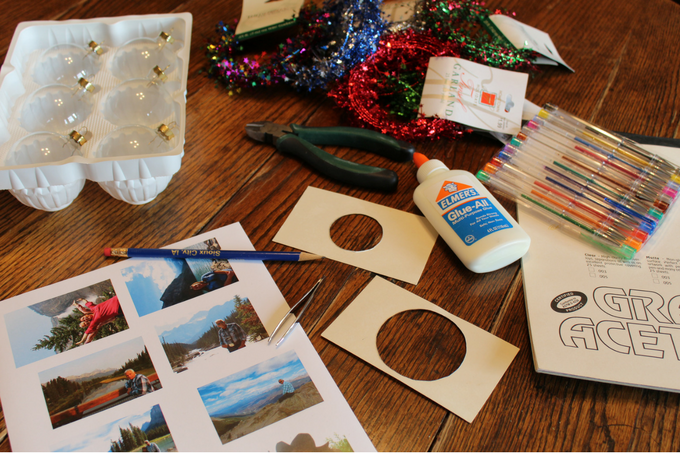 These DIY Floating Picture Ornaments are not difficult to make, but do require a few supplies to get started. 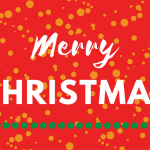 You will need: lightweight picture paper, a pen, an index card with a 1-3/4 inch circle cut out, an index card with a 2-5/8 inch circle cut out, scissors, Grafix Clear .005 Acetate Flim Paper, gel pens, glue, Clear Glass Ornaments, a pencil, tweezers, wire cutters, and Tinsel Garland. 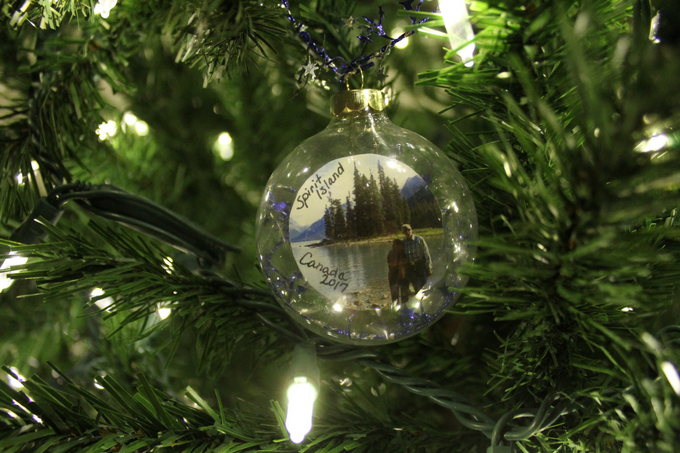 Start by finding some pictures that you want to include in your ornaments. 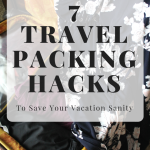 They can be from a family vacation, kid’s sporting activities, or just a favorite selfie! 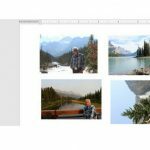 Using Microsoft Word, insert the picture onto a blank document and using the ruler guides along the sides, shrink your picture to approx 3 inches by 2 inches. 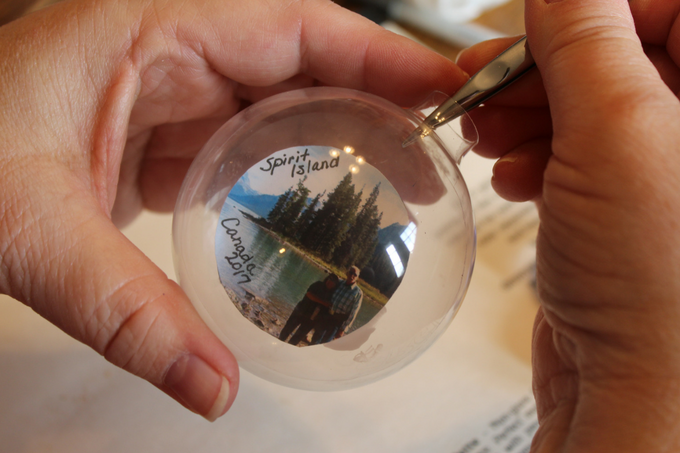 Fill the page with pictures you want to create into ornaments. I like to print this page onto regular computer paper to test the sizing. 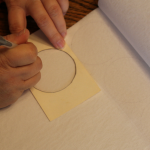 Using the index card with the smaller circle (1 3/4 inch) make sure that the subject(s) of the photo fit inside the stencil. 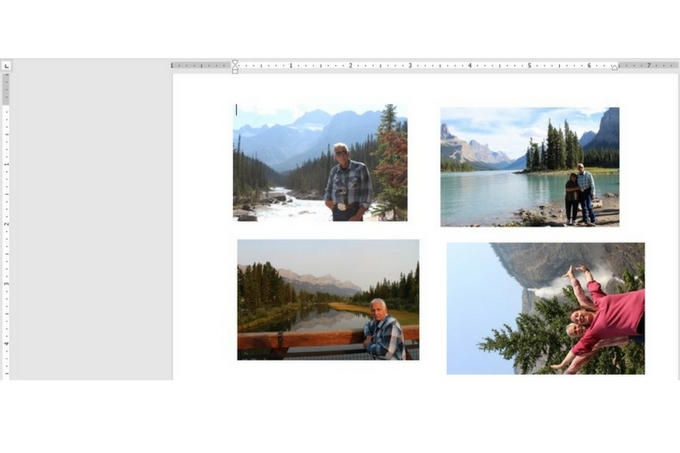 Once the pictures are the correct size, print the page onto a lightweight photo paper. 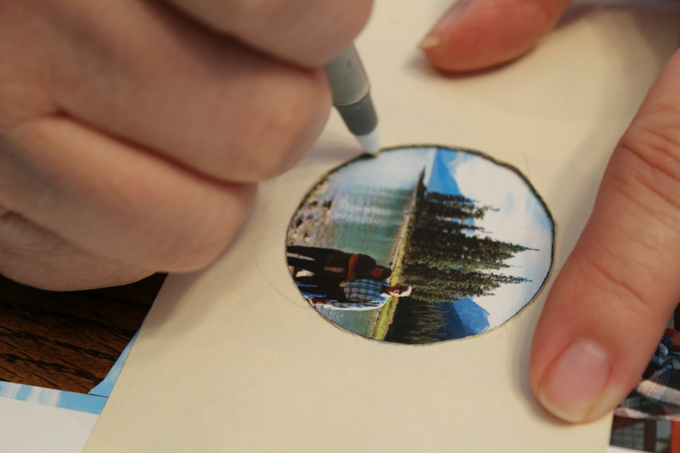 Place the index card stencil with the 1 3/4 inch circle onto your first picture. Move it around until what is shown in the circle is what you want to show in the ornament. Trace the stencil. 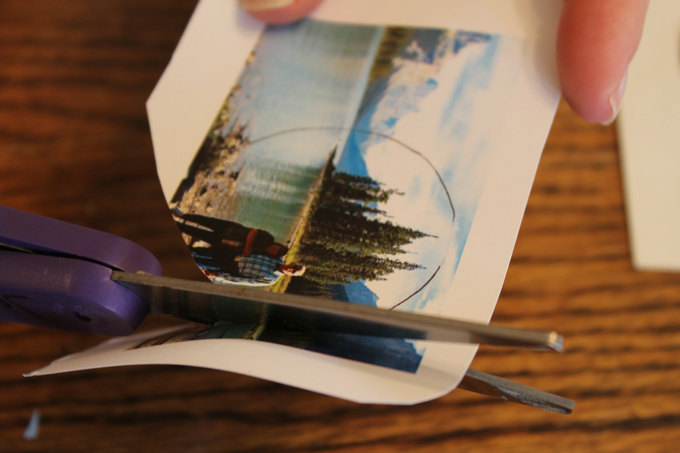 Then using scissors, cut out the picture. Using a gel pen, write any details (year, place, age) onto the picture. 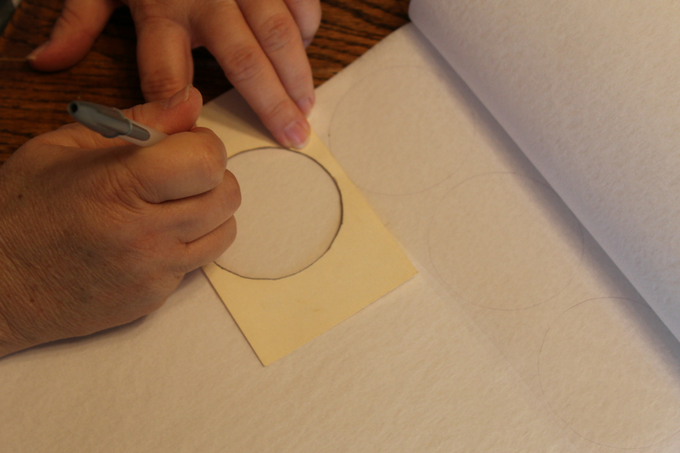 Using the second index card stencil with the 2 5/8 inch circle, trace onto the Grafix Acetate Film, and then cut out the circle. 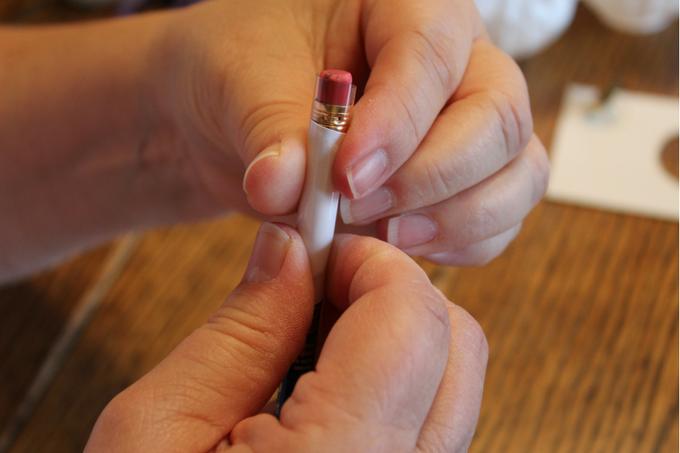 (You can use a slightly damp paper towel to wipe off any leftover pen marks). 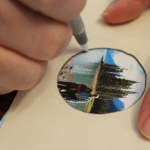 On the back of the picture circle, add a small amount of glue. Place the picture onto the Grafix circle. Press and smooth the glue so the picture is secured onto the Grafix. 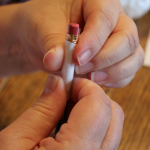 Roll paper around a pencil (picture facing inward toward the pencil). 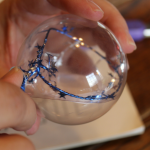 Place the pencil in the opening of the glass ornament and slide the picture inside. Remove the pencil. 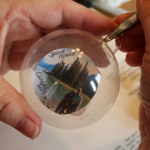 Use tweezers to position the photo in the glass ornament. Press the picture toward the front of the glass. Choose a color of tinsel garland and using wire cutters, cut one 12 inch piece and a second piece that is 10 inches long. 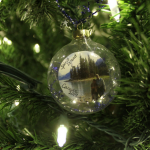 Gently thread the 12 inch piece of tinsel garland into the ornament, guiding it to circle behind the picture. 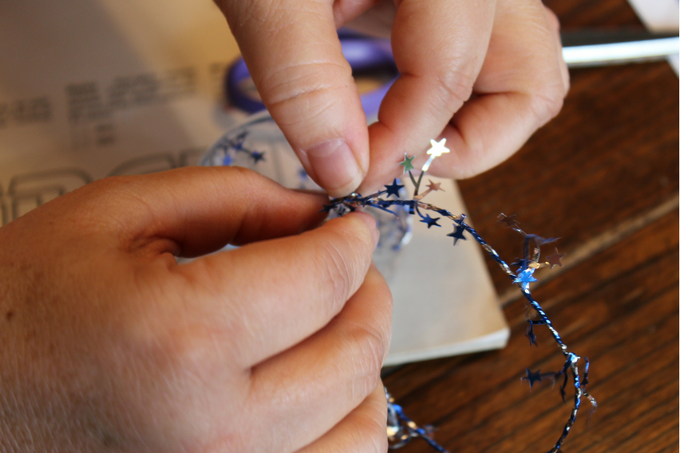 Allow the glue in the ornament to dry before replacing the top of the ornament. Add the 10 inch piece of tinsel garland to the ornament top to make a loop to hang on the tree. Select and size pictures in Word so the main subject of the picture is approx 1 3/4 inch. (On a standard picture I aim to have the picture about 3 inches x 2 inches). 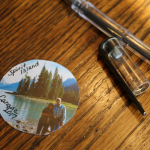 Print the page on regular paper and use the index card stencil with the 1 3/4 inch circle to make sure that the subject of the photo fits correctly. 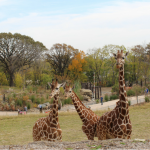 Once all pictures are adjusted to the correct size, print onto a lightweight photo paper. 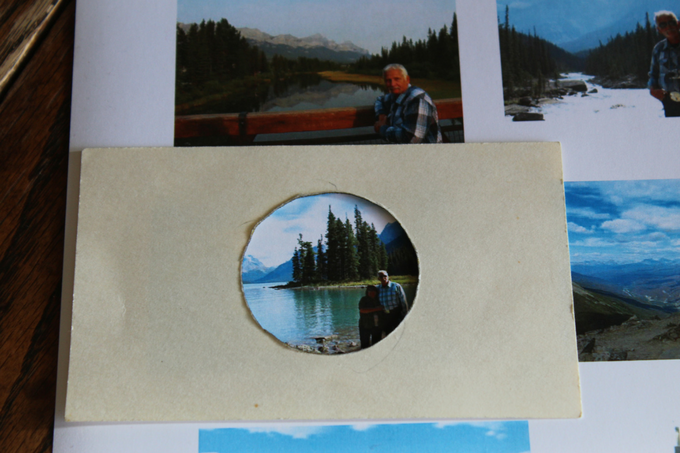 Place the index card stencil with the 1 3/4 inch circle onto the picture. Move it around until what is shown in the circle is what you want to show in the ornament. Trace the stencil and then using scissors cut out the circle. 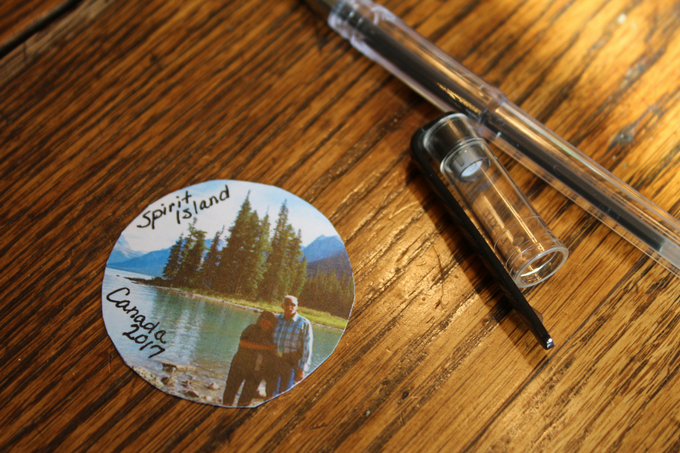 Using a gel pen, add names, years, or other details to the photo. Let dry. Place picture onto Grafix circle. Press and smooth glue so all of the picture is secure. 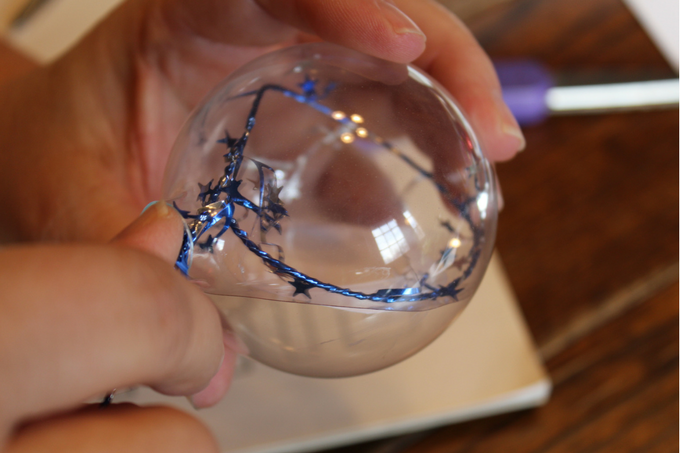 Use tweezers to position the photo in the glass ornament. Press the picture towards the front of the glass.